Our long-running Journal first published in 1994. 64 pages. 275x215mm. Printed on gloss art paper with card covers. 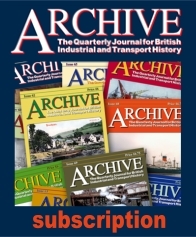 A subscription to Archive covers four issues, the journal being published quarterly in March, June, September and December. In line with the introduction of the General Data Protection Regulation (GDPR) which comes into force on the 25th May 2018, we will be unable to store your personal data without your renewed permission. By taking out a subscription you agree to our holding your data. Because of this change in the law, we have a duty to ensure that your personal data is protected. It will only be used by us to send you your journal and will be kept safe and not passed on to any third party.